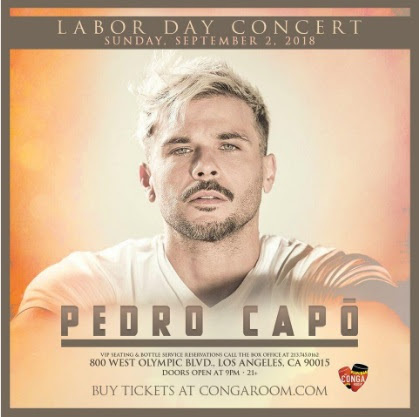 Acclaimed Puerto-Rican singer-songwriter and actor Pedro Capó will perform at The Conga Room in Los Angeles, CA on Sunday, September 2, at 9:00 p.m. With his vibrant fusion of rock, reggae, and Latin rhythms, the New York-based artist will be showcasing new music from his upcoming album Capó as well as songs from the rest of his four-album discography. Grandson of the renowned Puerto Rican melodist and singer Bobby Capó and son of the celebrated singer and cultivator of trova and salsa Bobby Capó, Pedro Capó is the third generation of a family that has left its stamp in Latin music. He picked up the guitar at an early age and quickly demonstrated great virtuosity with the instrument. In the mid 90s, he joined the group Marka Registrada as guitarist and lead singer. During his tenure with the group, they released a few albums and the popular single “Solo Pensando”. The following decade, Capó split from the band and moved to New York City to begin the next phase of his artistic career. Sony Music released his first solo album Fuego y Amorin 2007. In 2009, he performed a duet with popular Mexican singer Thalía called “Estoy Enamorado” from her album Primera Fila and another duet with the Puerto Rican artist Kany García called “Si Tu Me Lo Pides”, which was released on Capó’s self-titled second album. He released his third studio album Aquila in 2014, which spawned the successful singles “#FIEBREDEAMOR” and “Para Ayudarte A Reir.” The album also received multiple nominations in the 2015 Latin Grammy Awards. In 2017, Sony Music released Capó’s fourth album, En Letra de Oro, which features covers of popular Latin American songs performed in his own distinct style. Since his debut album, Capó has released seven #1 radio singles in Puerto Rico. He has also written for other award-winning international artists including Ricky Martin, Ednita Nazario, and Noel Schajris. In addition to music, Capó also has an active acting career. He was cast in a starring role by the Apollo Theater’s production of The Sweet Spot, which led the way to lead roles in the films Shut Up and Do It! and Paraiso Travel. He also had the chance to star in the Off-Broadway hit musical production CELIA: The Life and Music of Celia Cruz. At the moment, he is in the middle of the post-production of his fifth album titled Capó. Sunday, September 2, at 9:00 p.m.